When it was time to decide for Bihar, I knew what I had to make. I also have a funny and interesting incident to share. During Roti Mela, I had done extensive research on different Breads across the Indian States. 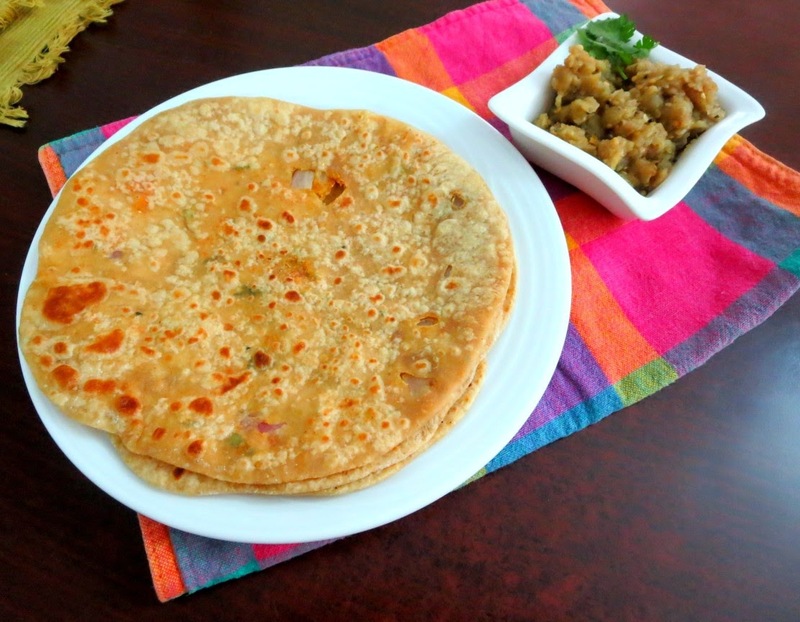 Sattu Ka Paratha was an obvious choice for Bihar even then. However, I was stumped in my research. After reading through a couple of sites, I concluded they were referring to roasted chana dal, which is nothing but Fried Gram or Pottukadai. When I discussed with a couple of north Indians, they insisted that Sattu is not Fried Gram and to make Sattu, one has to roast the chana dal to grind the dal. After so much time spent trying to ascertain, I simply gave up. My interest was piqued again when somebody in one of the FB foodie group asked where in Madras will one get Sattu Atta. Everybody was giving store details but I dropped the idea as it looked far fetching. Then came my Bihar colleague into the picture. She was the one who got us the Thekua for ICC from her mom. I suddenly realized I could ask her for Sattu details. Her family used to live in Bihar, after the division of states, their home is now in Jharkhand. She says the modern cuisine is same in both the states. The tribal or the village food would differ, otherwise, it's the same food made. I told her that I have been wanting to make Sattu Ka Paratha and asked if the Fried Gram we get here is same as what one gets by roasting chana dal as said by all those sites. She said it is different and also recollected how her mom roasts huge amount of Channa dal that would last them a month or so. They had a big clay stove that's placed outside the home. She was saying the chana dal they get in their place is different and roasting adds up the flavor. So I was back to square one and was thinking maybe I should become adventurous enough to actually use a clay stove myself and roast the channa dal. After a couple of months, my friend's mom came down to visit her in Madras. Sure enough, being keen to share the new finds with her mom, she took her around shopping. Would you believe she told me that her mom was shocked seeing the fried gram that is sold in our shops? Until then even my colleague was thinking it is different, only to be told it is the same. So when her Mom went back home, she carried as much Fried gram as she could! Another shocking fact was that many others with whom I shared this tidbit, didn't know that Fried Gram is got by roasting Channa dal. Well, I rested my case! Anyway when I started to plan Bihar, I again asked this colleague to confirm with her mom, if I need to roast the channa dal. What transpired was quite hilarious. Her Mom asked if we have gone crazy! Why struggle to do something, when it is readily available in the market. She said she roasts it because Fried Gram is not sold in their place. That was such a revelation! This dal is always stocked in the pantry at home and it never occurred to me that it may not even be made commercially in other places. This is one of the simple snacks we used to eat during childhood. Amma makes laddus, as stuffing, powder mixed with jaggery/sugar as prasadam and much more. 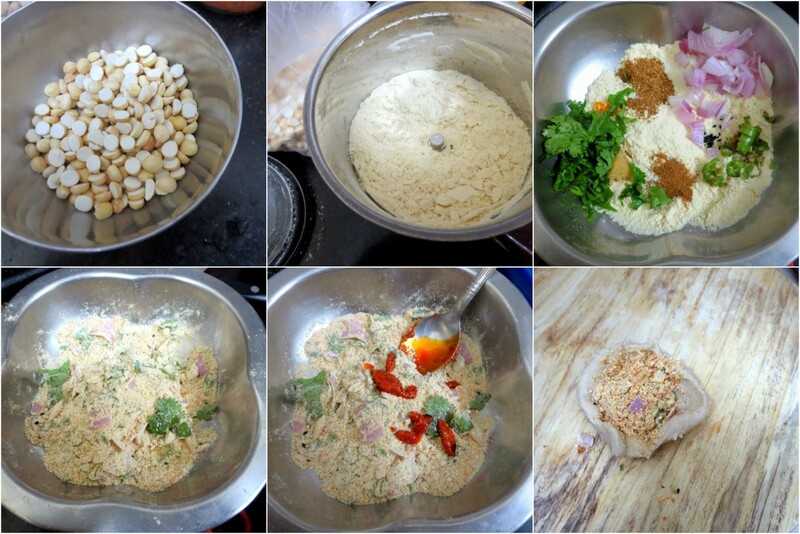 Since it is widely used in making chutneys, we call it as chutney dal as well. So while it took me a while to get over this shock, I realize that this Fried Gram may be available in other places, I have shared as told by my friend. And maybe it is now available but they continue to follow it as a habit. Sattu or Fried Gram flour is the flour from roasted channa dal, whereas Besan is got from unroasted or just dry chana dal. Coming back to the dish of the day, I got both Bihar and Jharkhand from this friend's mom. I even took these for her to taste and confirm it tastes just like how they make. 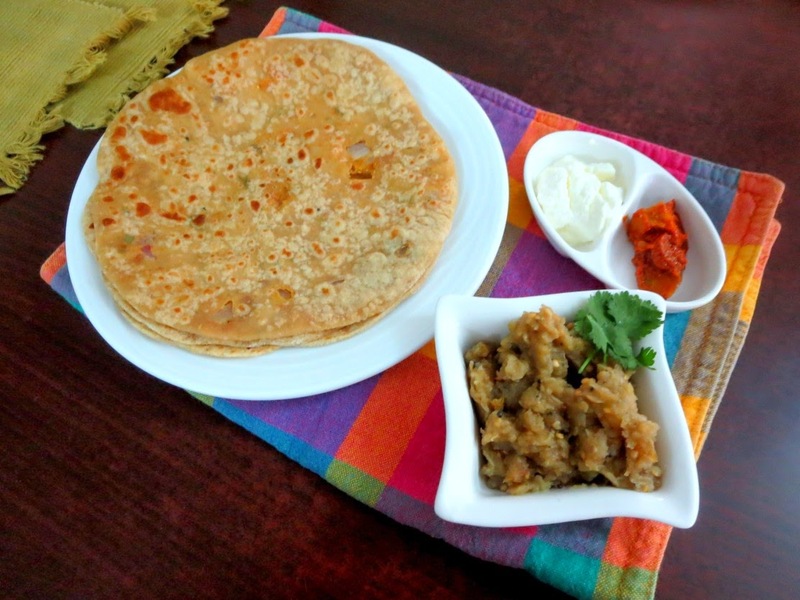 My friend said the most interesting thing about this paratha is the fact that they use pickle oil from any of the mango pickles that you have and is served with Baingan Ka bharta. When I said I already made this, she shared her version which was surely very different. Wheat flour - 1 & 1/2 cup. Make a stiff dough, so that filling and rolling becomes easy. In a wide bowl, take all the ingredients and mix well. You can increase the pickle oil as per your taste. 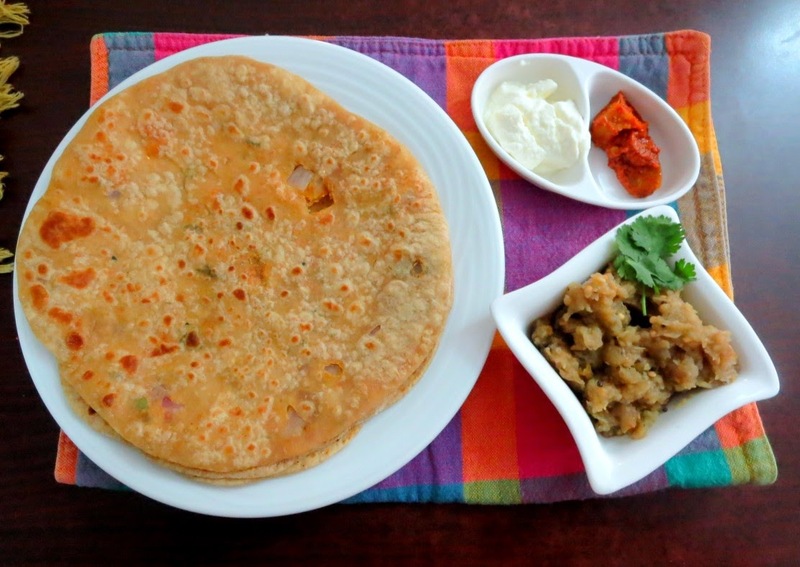 These parathas are then stuffed as any regular stuffed parathas. Since this is more powdery, it becomes little more hard to manage. Heat a Tawa, grease with oil and cook the paratha with oil on both sides. 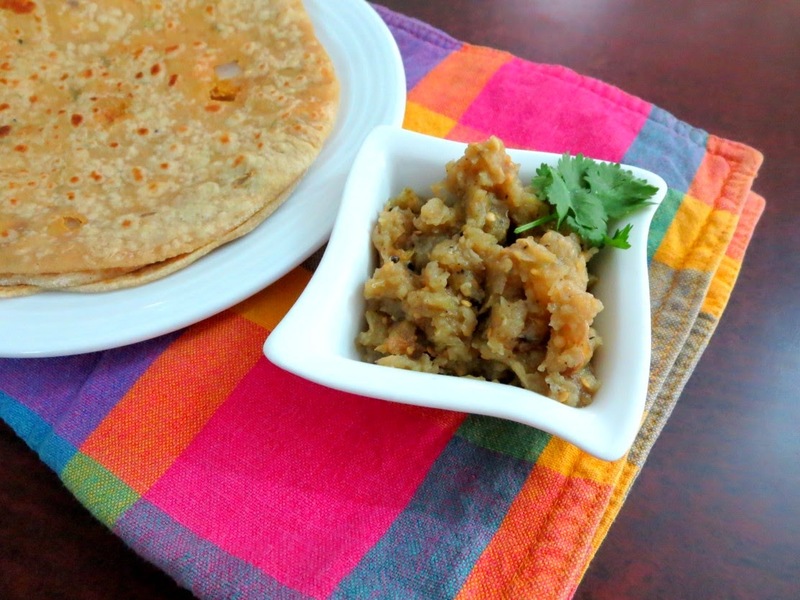 Serve Sattu parathas with Baingan bharta, Dahi, and pickle. The masala in the mango pickle can also be added, that adds up a different flavour to the parathas altogether. Since the filling is powdery, you can grease the inner side of the dough layer and then press it up. I sort of made mine little thin, my friend says these are really thick parathas. Wash and pat dry the brinjals. Make a slit through the middle portion of the brinjal and stuff it with garlic. If you want, you can apply over the brinjal and roast it. Else simply put the whole brinjal over flame and roast on all sides. Once it is completely roasted and cooked, takes about 5 - 7 mins. allow it to cool. Then mash well along with the garlic stuffed in. Add very finely chopped green chilies and salt. Serve with Sattu ka paratha.